Featuring engaging storylines rooted in themes of empowerment, diversity, friendship and sustainability, Genius Brands International’s Rainbow Rangers, which premiered on Nov. 5th on Nick Jr., follows the thrilling rescue-based adventures of seven 9-year-old girls who are Earth’s first responders, protecting people, animals, resources, and the natural beauty of our world. The series boasts a unique and highly-accomplished team of creators from the animated motion picture world, including Rob Minkoff (Disney’s The Lion King director), Shane Morris (Disney’s Frozen co-writer), Tim Mansfield and New York Times Bestselling author and Emmy-nominated writer Elise Allen (Dinosaur Train, Lion Guard, Barbie specials), who is serving as head writer and co-creator. Genius Brands’ Chairman and CEO and multiple EmmyAward-winning producer of more than 5,000 episodes of children's programming, Andy Heyward, serves as executive producer, with legendary Disney alum Ruben Aquino creating key designs. 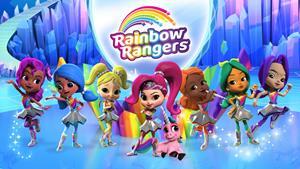 BEVERLY HILLS, Calif., Nov. 07, 2018 (GLOBE NEWSWIRE) -- Genius Brands International, Inc. "Genius Brands" (NASDAQ: GNUS), a leading media company that creates, produces and licenses children’s multimedia entertainment content and products for global broadcast, digital and retail distribution, delivers its new animated adventure preschool series, Rainbow Rangers, on Nick Jr., reaching 90 million U.S. TV households. The series premiere is being supported by a comprehensive marketing campaign across display, social media, e-blast and influencers with the Rainbow Rangers trailers distributed across Genius Brands’ Kid Genius channel, Baby Genius channel, and Affiliate VOD and OTT channels in over 80 million households. At the Rainbow Rangers launch event held yesterday at NASDAQ MarketSite in New York City, Genius Brands was joined by a roster of key brand licensing partners to present to investors an overview of the brand, including the upcoming 2019 retail launch of over 300 Rainbow Rangers-branded products coming to market from nearly 30 blue-chip manufacturers. Speakers at the event included Andy Heyward, Chairman & CEO of Genius Brands; Sam Susz, Director of Marketing at Mattel Toys; Erin Stein, Publisher at MacMillan Publishing’s Imprint; Todd Gershwin, CEO & President of Gershwin Entertainment, who unveiled their plans for Rainbow Rangers. Shelly Hirsch, Founder of The Beacon Media Group, ‘industry guru,’ and the single largest children’s media buyer in the U.S.—discussed the timeliness and commerciality of the brand. “I believe there is a void in the children’s market for a real breakout new TV franchise, so the timing for the release of Rainbow Rangers could not be happening at a better time,” said Hirsch. Beginning for back-to-school 2019 (July/August), Genius Brands will launch the U.S. retail program for Rainbow Rangers with products debuting across all categories of kid’s consumer products. Master toy partner, Mattel, will premiere a range of toys, including collectible dolls, traditional fashion dolls, role-play items, and a playset. Additional licensing partners include MacMillan Publishing’s Imprint (master publishing), Bentex (master apparel), Gershwin Entertainment (live touring show), A.M.E. (sleepwear), Berkshire Fashions (cold weather and accessories), BioWorld (bags, backpacks), Ceaco (puzzles), Disguise (Halloween costumes), Handcraft Manufacturing (packaged underwear), H.E.R. Accessories (jewelry and hair accessories), Jay Franco (bedding and bath), Dynacraft (bicycles), Kid Galaxy (bubble toys), Kiddieland (foot-to-floor ride-ons), Planet Sox (hosiery), KIDdesigns (youth electronics line), Cra-Z-Art (craft and activity kits), Esquire Footwear (sneakers, shoes and other footwear), Kittrich (school supplies and paper goods), and Basic Fun! (novelty toy line). Featuring engaging storylines rooted in themes of empowerment, diversity, friendship and sustainability, Rainbow Rangers follows the thrilling rescue-based adventures of seven 9-year-old girls who are Earth’s first responders, protecting people, animals, resources, and the natural beauty of our world. The Rainbow Rangers, who live in the magical land of Kaleidoscopia at the other side of the rainbow, have their own distinctive personalities and superpowers. Whenever there’s trouble for the people or animals of Earth, our seven heroines zoom into action and ride their Spectra Scooters across the rainbow to save the day. Viewers will join them on exciting adventures, but also see them at home having the same daily dramas and hilarities as every pre-schooler watching the show. And at its heart, Rainbow Rangers is about empowering and encouraging girls to take action and make a difference in their own homes and neighborhoods to improve and safeguard the planet. Rainbow Rangers boasts a unique and highly-accomplished team of creators from the animated motion picture world, including Rob Minkoff (Disney’s The Lion King director), Shane Morris (Disney’s Frozen co-writer), Tim Mansfield and New York Times Bestselling author and Emmy-nominated writer Elise Allen (Dinosaur Train, Lion Guard, Barbie specials), who is serving as head writer and co-creator. Genius Brands’ Chairman and CEO and multiple EmmyAward-winning producer of more than 5,000 episodes of children's programming, Andy Heyward, serves as executive producer, with legendary Disney alum Ruben Aquino creating key designs. Aquino is responsible for the design and animation of many of Disney’s most iconic characters from award-winning films including The Lion King, Beauty and the Beast, The Little Mermaid, Mulan and Frozen. Headquartered in Beverly Hills, Genius Brands International, Inc. (NASDAQ:GNUS) is a leading global kids media company developing, producing, marketing and licensing branded children’s entertainment properties and consumer products for media and retail distribution. The Company’s “content with a purpose” brand portfolio, which is led by award-winning creators and producers, includes preschool properties Rainbow Rangers for Nick Jr. and Llama Llama for Netflix; award-winning toddler brand, Baby Genius; adventure comedy STEM series, Thomas Edison's Secret Lab; and financial literacy and entrepreneurship series, Warren Buffett's Secret Millionaires Club. The Company’s content catalog also includes the animated series, Stan Lee's Cosmic Crusaders, created with Stan Lee's Pow! Entertainment. Seeing the need to provide kids and parents with a safe viewing environment that offers premium enriching and engaging programming, Genius Brands launched the Genius Brands Network – comprised of Kid Genius Cartoon Channel and Baby Genius TV, as well as an exclusive Kid Genius Cartoons Plus subscription channel on Amazon Prime. The Network channels are available in approximately 80 million U.S. households via a variety of distribution platforms, such as OTT, set-top box, internet and mobile. Through licensing agreements with category leading partners, characters from the Company’s properties also appear on a wide range of consumer products for retail. For additional information please visit www.gnusbrands.com.